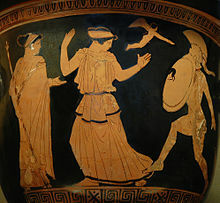 In Greek meethologie, Helen o Troy (Greek Ἑλένη Helénē, pronounced [helénɛː]), an aa kent as Helen o Sparta, or simply Helen, wis the dauchter o Zeus an Leda, an wis a seester o Castor, Pollux, an Clytemnestra. In Greek meeths, she wis conseedert the maist beautifu woman in the warld. Bi mairiage she wis Queen o Laconia, a province within Homeric Greece, the wife o Keeng Menelaus. Her abduction bi Prince Paris o Troy brocht aboot the Trojan War. Elements o her putative biografie come frae clessical authors such as Aristophanes, Cicero, Euripides an Homer (baith The Iliad an The Odyssey).